The Wood Butchers Guide to Technology: Ah - are we too old to learn ? I don't think so ! Marco Torres and Beyond Chalk. Ah - are we too old to learn ? I don't think so ! Marco Torres and Beyond Chalk. The last week have been extremely stimulating and has lifted my spirits in regards to education and the use of technology. Notice that I wrote "education" first. Gone are the days tinkering for technology for technology sake.THe modern approach is " I want to do such and such - what tools can assist me ? " Not " How am I going to make technology fit into the task I have to do ?" This is certainly not the thinking of students today. This was exemplified by an example I heard today, which was reflected within my own family. On two occasions my son was bought a wristwatch by well intentioned relatives. They both have never been worn. He has always used his phone to tell the time. Today I heard a similar story of a young lady who gave her niece a wristwatch - only to be asked "What else does it do?" Kids today - or should I say - reality today. 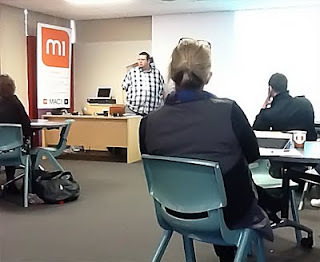 Last week I went to a very stimulating presentation by Marco Torres, a LA educationist, film producer, and keynote speaker at numerous International Technology and Education Conferences. It was a day of stimulating thought and discussion. He was a man who appears to be one of the people who initiated the Apple “Challenge Based Learning” (have a look at the Apple Educational website). He also produced a number of the “Myth Busters” TV series and the show is based on the Challenge Based Learning concept. When you look at the show you certainly see two guys learning ( not two guys teaching). Many of the aspects he spoke about are too involved to go into here - but as a brief summary these are some of the points that struck a cord with me. He spoke about people who have a passion for what they do. One thing they all had in common - they had a hobby ! He had made a study over a number of occupations and the most successful and passionate people were the ones who had an outside interest. They were able to make associations or connections with their interests and their jobs. He found the same for the teaching profession. If you want to be a remarkable teacher - get a hobby! He also gave many examples of students who were not overly academic - but had drive and passion. The ones who were curious and endeavored to take things one step further. Really - the mode of which we should be teaching. The approach of the modern learner is “ Learn, Create, Share”. We should be accommodating this style - not fighting against it because its not the way we have always done things. If I had to sum up two brief aspects I got out of his talk it would have to be “Teach Curiosity “. Fits very comfortably with the concept of “teaching for life long learning”. When it all boils down - it is the main skill we can give kids in this every changing, turbulent world. The second workshop I went to was of a more practical, hands on style. It was presented by “Beyond Chalk” - a group I have had dealings with before. This was more about “you want to use the technology for your students - here’s how”. Beyond Chalk are a group who use young, enthusiastic and knowledgeable presenters - no easy task considering the aging teacher population (in Australia at least). I always come away from these sessions invigorated, enthused and more knowledgable. Tori, the young lady presenting took us through various aspects of working with the mac platform to help and enhance our students learning. Very practical, student focussed and a spurt of student focussed enthusiasm. I always come away impressed and invigorated. If you get a chance to attend any of their workshops - if you keep an open mind, - you will certainly get something out of it. Ah - it's good to be stimulated and invigorated !